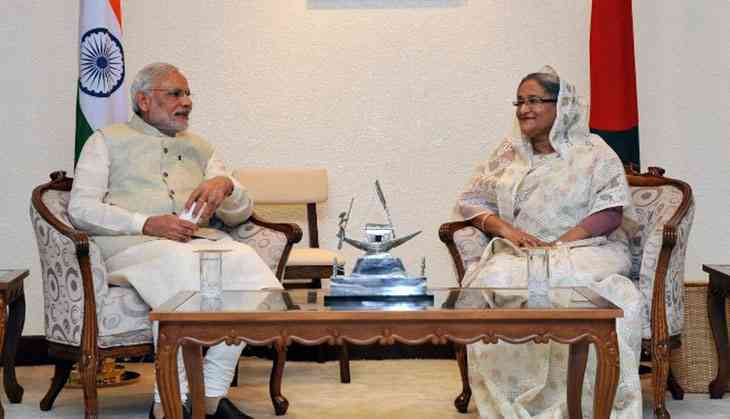 Home » international news » Sheikh Hasina's visit: will Bangladesh-India relations hit a new high? When Bangladesh Prime Minister Sheikh Hasina Wajed lands in Delhi on 7 April, she will not only get the traditional red carpet welcome, but also an unusual upgradation of protocol. Hasina will be staying at Rashtrapati Bhavan, as the special guest of President Pranab Mukherjee, who will also host a banquet in her honour. This is clearly a departure from standard Indian protocol, where the Indian Head of State normally hosts a foreign Head of State. According to the old protocol, Prime Minister Narendra Modi, as Head of Government, should have hosted Hasina. But Modi will host a lunch, since President Mukherjee has decided to host the evening banquet. Modi may even receive Hasina personally at the airport, a gesture that will break established protocol and highlight the importance of the visit. President Mukherjee has had a long association with Hasina, since the days she and her family were in exile in India, after her father, Sheikh Mujibur Rahman, and other members of the family were assassinated in Dhaka by Army officers and soldiers in August 1975. Hasina and sister Rehana escaped being killed since they were visiting West Germany. Modi may have ceded his protocol prerogative to President Mukherjee for a good reason – West Bengal's feisty Chief Minister Mamata Banerjee. The President has been a mentor to both Hasina and Mamata in different ways, and Mamata would not say no to Mukherjee if he made a request. Engaging Mamata is important for the Central government, because without the consent of the West Bengal government, the Teesta water sharing agreement will remain in limbo. Under the Indian Constitution, water is a State subject and attempts to bring it into the Concurrent list of subjects have not succeeded for several decades. Mamata may have spurned an invitation from Modi, given the political tension between her and the PM. Hence, the banquet in Rashtrapati Bhavan hosted by the Rashtrapati, which Mamata is expected to attend. Hasina is coming on a bilateral visit to India after six years. Modi had visited Bangladesh in 2015, while Hasina had visited Goa last year as part of the outreach between leaders of BRICS and BIMSTEC, during the BRICS Summit. Questions have been raised as to why her visit has been rescheduled twice. If one surveys the hyperventilating Bangladesh media, it would seem the aborted Teesta water sharing agreement and the impending defence cooperation agreement were two main causes for the changes of dates for the visit. Hasina may have rightly decided that if she could go back with the Teesta agreement, it would be the icing on the cake, boosting her domestic popularity. Hasina would have played for time, hoping that the Teesta agreement would be concluded before she undertook her visit. The proposed bilateral defence cooperation agreement has been initiated after the controversy raised in the Indian media over Bangladesh's acquisition of two Chinese-made submarines. China has been making aggressive moves in Bangladesh and other countries in India's neighbourhood, after making Pakistan a virtual vassal state with its $46 billion package for the China-Pakistan Economic Corridor (CPEC) and setting up a naval base at Gwadar, a new port on the Makran coast in Balochistan. China has also promised Bangladesh billions of dollars in investments and economic aid. China has bagged contracts for building the Padma Bridge and civil construction of a new deep-sea port at Payra. China's outreach into Bangladesh for infrastructure building is not new, but it has acquired a worrying dimension for India. Bangladesh's defence assets are primarily of Chinese origin. The active China-Pakistan lobby in Bangladesh has vociferously objected to the defence cooperation agreement with India, and the Bangladeshi media has been inundated with articles opposing the agreement. Bangladesh is no doubt playing the China card vis-à-vis India, and this reality has to be faced by Indian policy makers. China is keen to carve out an Eastern corridor into the Bay of Bengal as a mirror image of the CPEC. Geography is, however, more complicated. The Bangladesh-China-India-Myanmar (BCIM) economic corridor has to traverse four countries, and India is not holding its breath and rushing headlong into this agreement. For Bangladesh, it may be a win-win situation, wherein she draws benefits from both countries, and from her point of view, it is unexceptionable. India cannot get into any competition with China on Bangladesh on geopolitical, geoeconomic and geocultural issues wherein India has some advantages. The Teesta agreement may not happen, but the defence cooperation agreement will be signed. This agreement will do no more than bring current defence cooperation, largely training, into an institutional framework. The defence agreement is likely to be of a five-year duration. 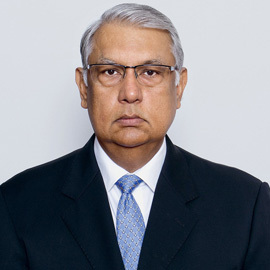 It is also expected that a Line of Credit agreement will be signed for acquisition of defence equipment by Bangladesh. It seems that these pro-Chinese and pro-Pakistani sections of Bangladesh have no problem with China-Bangladesh and even Bangladesh-Pakistan defence cooperation, but their hackles are raised when it comes to defence cooperation with India. This lobby projects that defence cooperation with India is a surrender of sovereignty. The Partition mindset in a section of Bangladesh has not died, even after the bloody war of liberation, and is sustained by a generation of former defence personnel who were trained in Pakistan and maintain links with their former Pakistani course colleagues. The Pakistan/'Islam-pasand' section is upset with Hasina because she has downgraded relations with Pakistan and sided with India, in boycotting the SAARC summit in Islamabad. This lobby has not forgiven Hasina for going after the pro-Pakistani Jamaat-e-Islami, whose leaders have been found guilty of war crimes and hanged. Hasina has already rebutted this lobby by saying that she knows how to protect her country's interests, and nothing will be done which will undermine that. It is unfortunate that many in Bangladesh become fixated with one issue and harp on it continuously, sidelining everything positive in Bangladesh-India ties. While it is the democratic right of the Opposition parties and the media in Bangladesh to criticise Hasina, it is clear that such criticism must be weighed against the positive developments in bilateral ties. Hasina must be credited for guiding bilateral ties with India to a level hitherto unattained. Bangladesh has cracked down on Indian insurgent groups and handed over some of their leaders operating out of Bangladesh. ULFA leader Paresh Barua managed to escape, and is reportedly either in the badlands of northern Myanmar or in China. Recently, he issued a warning to India about the Dalai Lama's visit to Tawang, echoing China's warning. This indicates that he is in perhaps in China and singing a Chinese tune. The degree of trust and understanding between Bangladesh and India, built on a successful framework of security cooperation, has led to unprecedented cooperation in intelligence sharing, as both countries grapple with radical Islamists. The Hasina government has successfully conducted anti-terrorist operations against Islamist groups that have grown roots on Bangladeshi soil. Given the long, shared, and porous border, these radical elements frequently flee across the border for seeking refuge, and intelligence coordination plays a vital part in tracking and locating their hideouts. Moderate Islamists in Bangladesh are an influential lobby, and their demands are the usual mix of turning Bangladesh into an Islamic state, enforcement of Sharia law, and removal of statues from public places. The violent Islamists have indulged in outright terrorism, motivated by the perverse ideology of the ISIS. Political parties in Bangladesh, including the relatively secular Awami League, headed by Hasina, have indulged in appeasing the moderate Islamists like the Hefazat in domains like the education curricula. One rumour that has swept Bangladesh is that the Hasina government has agreed to expunge all texts written by Hindus from school books, a demand put forward by the Hefazat. If true, this will boomerang, as similar demands will squeeze the shrinking minority Hindus in Bangladesh and add to their insecurity. Hasina's visit is likely to see another slew of agreements, a new Line of Credit worth at least $5 billion, an understanding on river basin management to offset the pending Teesta agreement, and agreements on the Blue Economy and joint collaboration in the Bay of Bengal One area, where the two governments should concentrate in pursuing joint collaborative efforts in preserving and sustaining the unique ecological space of the Sunderbans. Development cooperation is a crucial area of bilateral interaction, and an ongoing study by the civil society organisation PRIA is looking at case studies of Lines of Credit in the transportation sector and connectivity to assess the value addition in these areas. Such studies will help in focussing and directing funds into projects that provide the maximum benefits to the people. Bangladesh-India ties have entered an era of consolidation and expansion. Trade figures have gone up to $7 billion, though the adverse trade balance remains an issue. India has tried to offset the trade imbalance by providing Lines of Credit and grants. A more fundamental solution will be when Indian companies invest in the SEZs and export manufactured products back to India, redressing thereby the adverse trade balance. Border management, trade facilitation, trade infrastructure and cross border migration remain areas of concern that the two governments have to tackle. READ NEXT >> Acrush is one of China's most popular boy bands, and they're all-girl!